I recognize that early January is a time of year traditionally reserved for repentance and asceticism, but I’ve never been much good at either of those. After many years of making my never-changing Annual New Year’s Resolution (yeah, I’ll tell you mine if you tell me yours), this year I didn’t make one at all. So while better women are perfecting their green smoothie technique or annoying the regulars at the gym, I’ve been getting over my fear of deep frying. And I’m so glad I did. This dish is spectacular for a few reasons. The flavors are deep and rich and sweet, beautifully spiced but not at all spicy. You probably already have all the ingredients in your cupboard, but I bet it won’t cost you $2 if you have to restock anything for this recipe. And the leftovers just get better and better as the days go by. The recipe is from Jerusalem, my favorite cookbook of the moment, and we’ve been enjoying this dish alongside those roasted squash and onions from the same source. Apparently I’m not the only one who’s captivated by Jerusalem; Beth of OMG! Yummy has started up a virtual cookbook club on Facebook and Twitter to cook through “and beyond” its pages. Sounds good, right? Join us! I always like the chance to cook with friends. So anyway, about the frying. I’ve never liked the idea because (a) a pot of hot oil is scary and (b) it seems like adding an unnecessary amount of oil to the food. But I did it, and I will do it again to have these onions again. And again. I used my heaviest pot on a back burner, and long-handled tongs in order to keep a safe distance. I measured the oil before and after cooking and you know what? Only a few tablespoons were actually absorbed by the onions (plus the paper towels, plus drips). I’m a convert. One word of warning: in spite of its simplicity, this isn’t a quick recipe, so plan ahead to spend some time in the kitchen. It took about half an hour to fry the onions, and another half an hour to cook the rice and lentils together. Adding in the time it takes to pre-cook the lentils and get the rest of your ingredients together, I suggest that you get started well before dinnertime. If you are a more experienced fryer maybe you can deal with cooking other parts of the dish while the onions are cooking, but as a novice they required my full attention. 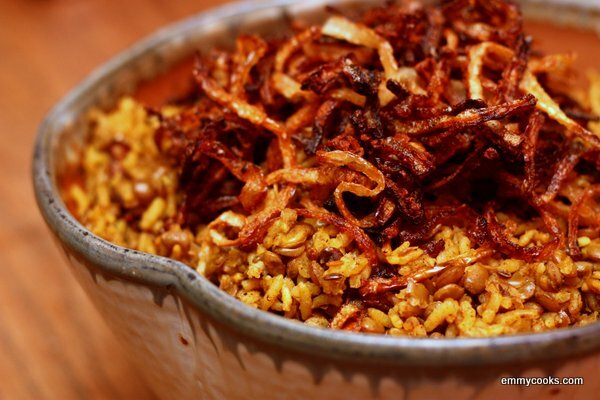 Lentils and Rice with Fried Onions: Sort through 1 1/4 c. brown lentils to remove any tiny hiding stones. Rinse them well, put them in a small pot covered with plenty of water, and bring them to a boil. Lower the heat to a gentle boil and cook for 12-15 minutes, until they are softened but not completely cooked. Drain and let them cool. Meanwhile, in a small bowl, combine 1/2 tsp. turmeric, 1 1/2 tsp. ground allspice, 1 1/2 tsp. ground cinnamon, 1 tsp. sugar, 1/2 tsp. salt and several grinds of black pepper. Set spice mixture aside. Peel 1 1/2 lbs. onions (for me this was 2 large onions), halve them, and cut them into thin crosswise slices. Spread the onions on a big plate or platter, sprinkle with 3 Tbsp. flour and 1 tsp. salt, and toss well to distribute the flour and salt. Be brave: pour a cup of sunflower oil into a medium-sized, heavy pot and turn your burner up to high. You’ll know that the oil is hot enough when a piece of onion sizzles merrily the moment you drop it in the pot. Fry the onions in 3 batches; mine took about 10 minutes each. Use a slotted spoon or tongs to stir and turn them occasionally, and then to drain them a bit as you lift them, deeply golden and fragrant, from the pot to a paper-towel-lined colander. Sprinkle them with another pinch of salt. Taste one. See what I mean? Turn the heat down a bit once the oil gets nice and hot to keep them from burning as they cook. Once all the onions are done, wipe out that same pot and add 2 tsp. whole cumin seeds and 1 1/2 Tbsp. whole coriander seeds to it. Toast the seeds over medium heat until fragrant, 1-2 minutes. Add 1 c. basmati rice, 2 Tbsp. olive oil, and the spice mixture (turmeric, etc.) you made earlier. Stir for a moment to coat the rice with oil, then add the drained lentils and 1 1/2 c. water. Bring to a boil, then reduce heat to a simmer and cook, covered, for 15 minutes. Remove from heat, stretch a clean dishtowel under the lid, and leave the pot to steam for 10 more minutes. Just before serving, stir half of the fried onions into the rice and lentils. Transfer to a serving dish and pile the remaining onions on top. This entry was posted in Beans and Other Legumes, Grains, Middle Eastern Flavors, Vegan or Would-Be-Just-As-Good-Vegan and tagged budget meals, lentils, mejadra, mujaddara, onions, rice, vegetarian recipes on January 9, 2013 by emmycooks. welcome back! and I loooove mujedra so I will be right over. Goody! I’ve been wanting to have lunch together. I’ve seen mejadra in cookbooks and have wanted to make it – it has everything I love in it – but keep putting it off. Gosh, this looks good! I can tell I’m going to enjoy cooking with you Emmy – a new year’s resolution that includes frying – yahoo! Cathy Barrow of Mrs. Wheelbarrow’s Kitchen also made the Mejadra and loved it. And thanks a bunch for the shout out! Hi Kalyn! I often have a stash of caramelized onions in the fridge, so I’ll have to try using them on a day when I can’t stand over the stove for so long. Have you made other recipes from Jerusalem that you’d recommend? I hardly know what to make next, it all looks so good. Take care! Emmy, I am with you on the frying. I get a little antsy. I usually only deep fry tempura, but those onions look amazing! Actually, the whole dish looks incredibly beautiful and tasty. What an excellent resolution. I’d say you’re setting yourself up for success! :) And hurray for cooking with friends–I’m looking forward to it! This is one of my favorite meals ever! I first had it when I was studying abroad in West Africa. The only differences are that instead of lentils, there are black-eyed peas. And instead of sunflower oil or olive oil, it’s palm oil. Which I never knew was solid at room temperature until I got back to the States. Because room temperature in West Africa is over 100°F! Also just got Jerusalem too! Looking forward to cooking from it too! I am all over that – one of my favorites dishes ever! I just checked Jerusalem out of the library and have a feeling I will be buying it! I make a sort of similar dish with rice, lentils, onions and a spicy tomato sauce. Can’t wait to try this one – which looks delish! I just saw a copy of Jerusalem tonight – what a beautiful looking cookbook! YUM! I love the look of those onions! Jerusalem is number one on my to-buy list at the moment. Lovely looking bowl of food. I love it! Jerusalem is also my fave right now! Working my way through the “wintery” recipes. That’s UNcooked rice, right? Sounds and looks delicious. Everyone is raving about this cookbook. Looking a this dish, I can see why. Oh, those onions … I can just imagine how good they must be. And combined with rice and lentils … oh my. Also, I love that you meticulously measured the oil before and afterwards! That’s definitely encouraging that the onions only absorbed a few tablespoons of oil. I really need to buy myself a copy of Jerusalem, and soon! I absolutely love this dish and enjoyed it many times on the streets of Cairo. Emmy and I have a very strange connection, I crave a food and Emmy cooks it, in Seattle!!!! I would happily retire as a food blogger and just cook the recipes on Emmy Cooks.